Are you in the business of helping folks find a home, sweet home? The home-buying experience is all about relationships (that’s just one reason realtors tend to put their photos on business cards and other marketing materials!) and collecting new leads is the key to building a list of potential clients. However, collecting and nurturing leads can be a challenge. We often receive questions from our customers who work in real estate, wondering about how they can leverage our platform to promote their business. Below you’ll find four lead-generation and email-marketing ideas perfect for realtors, property managers and developers, and mortgage brokers. Newcomers to your city are a bit different from people who have been living there. For starters, they aren’t so sure which part of town will suit them and their families. That’s why Jakovac Real Estate’s relocation guide campaign is such a great idea! 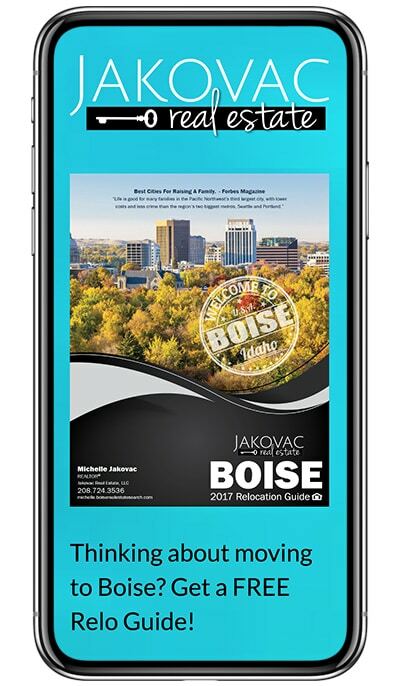 People moving to Boise can visit the Jakovac Real Estate’s landing page to download a guide that will help them learn more about the city they are moving to. At the same time, the realtors at Jakovac Real Estate collect valuable leads from interested home buyers. Email Marketing Suggestion: Looking to use the email addresses you collect for for email marketing purposes? If so, send your relocation guide via email. This way, people need to submit an active email address to receive the guide. Quizzes can be a useful tool for providing potential customers with a bit of helpful insight. With their “Are you ready to buy a home?” quiz, Tal Adair asks potential homebuyers key questions they should consider before they take out a mortgage. After answering the questions, folks must enter their name and email address to learn their results. Results range from “Buying a home may not be for you…” to “Call me today! 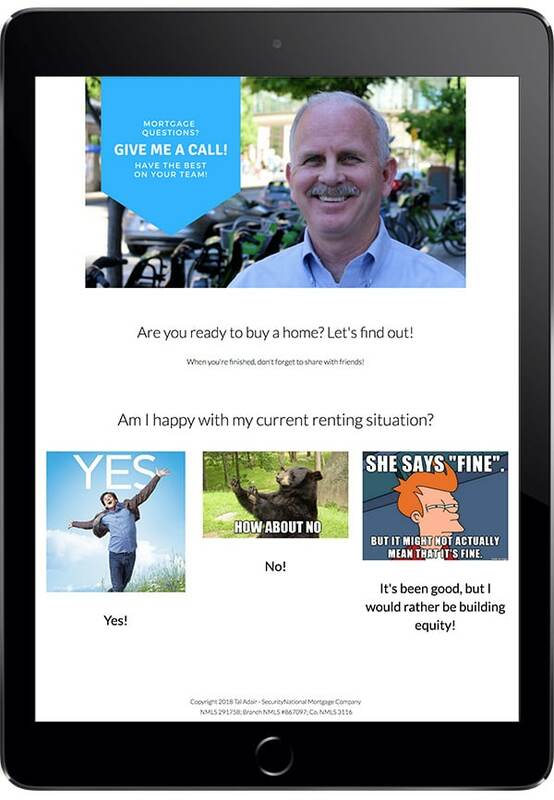 Let’s work together and find the right solution to your mortgage needs.” Not only does Tal Adair collect leads, but they also see quiz-takers’ results, allowing them to segment their leads to better target their advertising. Email Marketing Suggestion: Send follow-up emails to qualified leads using our filter feature. Just approve the entries you think fit your target market, then setup a filter within your follow-up email. This way, only approved entries receive those emails. Move over paper brochures! A property landing page is the perfect way to advertise a new development or your current listings. 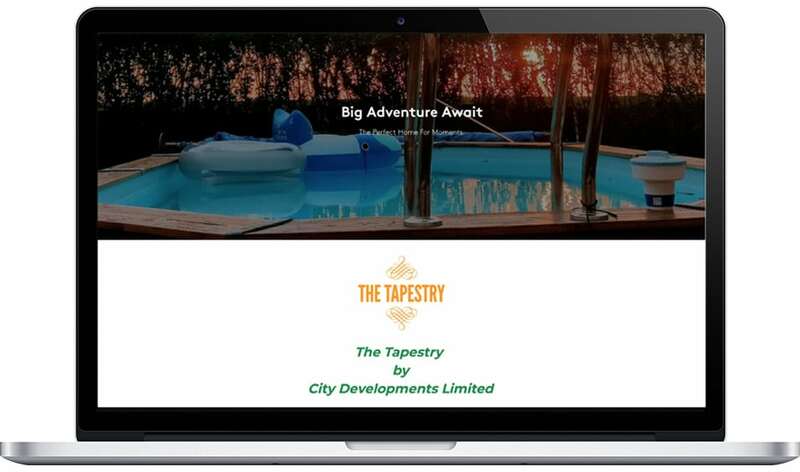 The landing page for The Tapestry by City Developments Limited features interactive elements, such as a video and a lead-collection form, along with the traditional property description. Mixing property images and descriptions with a video can help people imagine what it will be like to actually live at the property. Plus, including a form for interested individuals to fill out to receive updates via email helps you focus your marketing efforts. Email Marketing Suggestion: Let folks on your list know about your latest properties. Use our scheduled emails feature to send new listings once a week or once a month. This is an effortless way for potential customers to stay informed about your new inventory. Ever wonder how to collect information about people visiting your site? Try a simple giveaway! Folks who are browsing your website might not leave their information via a sign-up form for your newsletter, but they could be more interested in a giveaway. 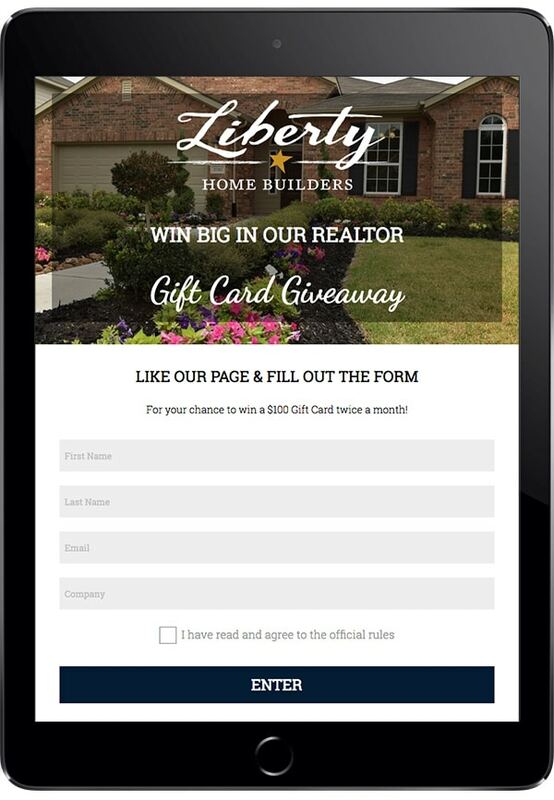 Make it easy, like the entry form Liberty Home Builders setup, or ask for a bit more information from the entrant. For example, you could ask entrants if they plan to build a new home, and if so, how far in the future they wish to realize this dream. Email Marketing Suggestion: Ask entrants to opt into your email marketing list. After form submission, send an autoresponder with an opt-in link and a preview of the content you will send to subscribers. Show off happy clients with our Testimonials template.